Known as Minty, I’ll be 54 on race-day, and accurately described as “solid” in appearance by a well-known Aussie WHW runner. I’ve latterly down-graded after many years in cut-throat management, and now I do the accounts for a company selling large AD plants to farms, turning cattle slurry into gas and electricity. Think of the value of this stuff as you trudge through Cow Poo Alley! I live in rural Warwickshire; husband to Julia – who runs faster than me and who heads up my support team (actually she’s the only one in it ATM, hint hint), with three lovely grown-up daughters (who all ran a mile when I suggested crewing for me), and a couple of mischievous yet adorable grandsons. Amateur musician playing lots of instruments just as badly as I run. I’ve completed 25 ultras since 2010, beginning with the first ever D33. 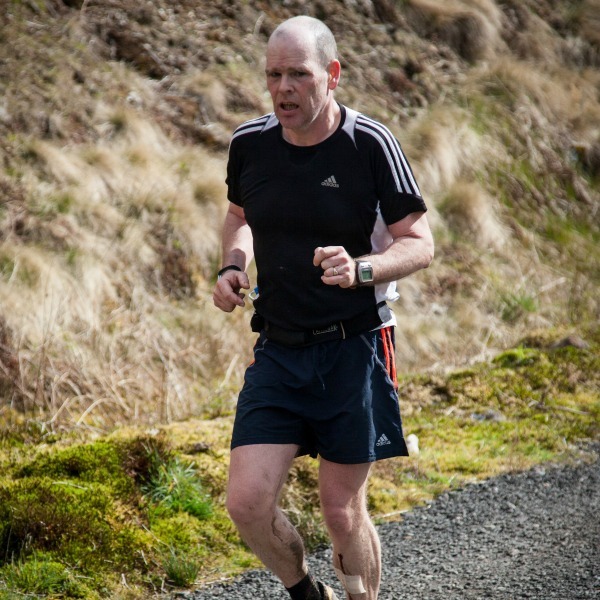 Built up strength and stamina via Flings and Cateran 55s up to my first WHWR in 2013. Had a ball until a trip and banged my head 8 miles from the end – I reckon I may be the only runner to have had have a little snooze on the Lairig Mor cobbles during the race! Anyway, with help from other runners, Lundavra marshal Neal Gibson and my ace support team, I finally made it to the finish in 27 hours, a few stitches and an overnight stay in the hospital and out just in time for prize-giving! I managed one further goblet in 2015 (31 hrs) but chronic leg injuries were already having a negative effect, and frankly, since then I thought my WHWR days were well behind me. I’m really happy and content when I run on the WHW – it’s where I love to be. You can’t beat a long day on the trails in the Highlands! Plus I have so many cherished friends attached to the trail and this race. Last year I was struggling even to complete parkruns, but hearing some MV60s (you know who I mean) bang on about their (truly) brilliant race times made me confront the (wide) mirror and decide do something about this slide to uselessness. So I entered the 2019 ballot and got lucky… yikes! From then on, I’ve been working extra hard to shed a lot of excess weight, use a sports physio and get out there and put the miles in – on the trails as much as I can. Time on legs is what it’s about – the speed-work may come later!